Photographers routinely compose multiple manipulated photos of the same scene into a single image, producing a fidelity difficult to achieve using any individual photo. Alternately, 3D artists set up rendering systems to produce layered images to isolate individual aspects of the light transport, which are composed into the final result in post-production. Regrettably, these approaches either take considerable time and effort to capture, or remain limited to synthetic scenes. 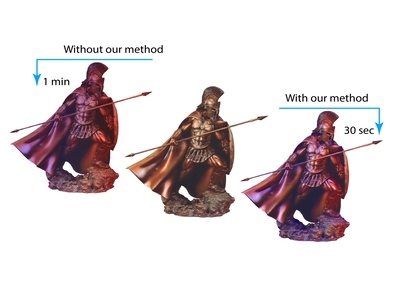 In this paper, we suggest a method to decompose a single image into multiple layers that approximates effects such as shadow, diffuse illumination, albedo, and specular shading. To this end, we extend the idea of intrinsic images along two axes: first, by complementing shading and reflectance with specularity and occlusion, and second, by introducing directional dependence. We do so by training a convolutional neural network (CNN) with synthetic data. Such decompositions can then be manipulated in any off-the-shelf image manipulation software and composited back. We demonstrate the effectiveness of our decomposition on synthetic (i.e., rendered) and real data (i.e., photographs), and use them for photo manipulations, which are otherwise impossible to perform based on single images. We provide comparisons with state-of-the-art methods and also evaluate the quality of our decompositions via a user study measuring the effectiveness of the resultant photo retouching setup. Decomposing Single Images for Layered Photo Retouching. Carlo Innamorati, Tobias Ritschel, Tim Weyrich, Niloy J. Mitra. Computer Graphics Forum (Proc. Eurographics Symposium on Rendering), 36(4), pp. 15–25, July 2017.Carlo Innamorati, Tobias Ritschel, Tim Weyrich, and Niloy J. Mitra. Decomposing single images for layered photo retouching. Computer Graphics Forum (Proc. Eurogr. Symp. on Rendering), 36(4):15–25, July 2017.Innamorati, C., Ritschel, T., Weyrich, T., and Mitra, N. J. 2017. Decomposing single images for layered photo retouching. Computer Graphics Forum (Proc. Eurogr. Symp. on Rendering) 36, 4 (July), 15–25.C. Innamorati, T. Ritschel, T. Weyrich, and N. J. Mitra, “Decomposing single images for layered photo retouching,” Computer Graphics Forum (Proc. Eurogr. Symp. on Rendering), vol. 36, no. 4, pp. 15–25, Jul. 2017. We thank our reviewers for their detailed and insightful comments and the user study participants for their time and feedback. We also thank Paul Guerrero, James Hennessey, Moos Hueting, Aron Monszpart and Tuanfeng Yang Wang for their help, comments and ideas. This work was partially funded by the European Union’s Horizon 2020 research and innovation programme under the Marie Skłodowska-Curie grant agreement No 642841, by the ERC Starting Grant SmartGeometry (StG-2013-335373), and by the UK Engineering and Physical Sciences Research Council (grant EP/K023578/1). Disclaimer: The documents contained in these pages are included to ensure timely dissemination of scholarly and technical work on a non-commercial basis. Copyright and all rights therein are maintained by the authors or by other copyright holders, notwithstanding that they have offered their works here electronically. It is understood that all persons copying this information will adhere to the terms and constraints invoked by each author's copyright. These works may not be reposted without the explicit permission of the copyright holder.